So now Tiny has been at Nursery School for a few months, he has started doing one full day a week. At first I was very worried about this, as he has been used to a hot meal at lunchtime and he has never been a fan of any sandwiches, and also because this issue has never come up for me before. Big'Un never went to nursery, she went straight in at Reception and had school dinners and that was that. Littl'Un did go to the Nursery but the rules and hours were different and so she only did 5 three-hour sessions a week. In other words, she did mornings in nursery and came home for lunch. She also has school dinners, and both girls love their hot school meals at lunch time. So I realised that to make this work, I was going to use my imagination and think laterally. It dawned on me that if I don't have a hot meal to give him at lunchtime, I usually give him a what we call a "monkey plate" of bits and pieces of food from the various food groups, colourfully arranged on a plate with different sections. If I could translate this to a lunchbox, I was sure he would enjoy it. 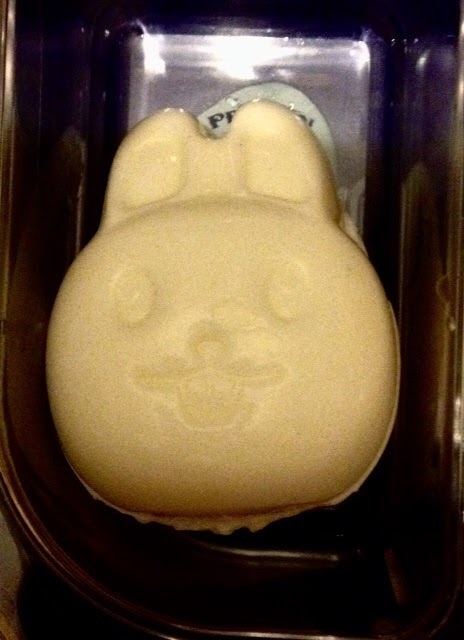 Then I discovered the amazing world of bento boxes. Bento is a very ancient Japanese type of snack box, with partitions to keep the various foods separate. In modern day Japanese culture, there are thousands of websites and photosites of "kyaraben" - and although I find these cute, I honestly don't have the time or energy to prepare those, and also the ingredients and tools needed are impractical for our purpose. So after a lot of research, and a few false starts, I found this amazing lunchbox, the Yumbox, which is perfect for Tiny. The latch is easy to open, it is leakproof, has separate sections with guidelines/reminders of the food groups to try to include and the lid stays open when you want it to. 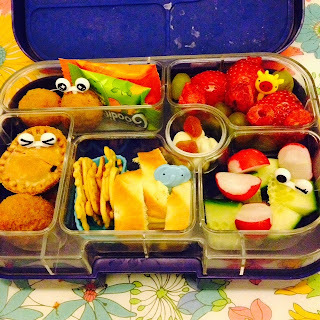 My lunch packing has evolved and I've learned to think outside the box (sorry, pun not intended!) and find small, packable, interesting, and most importantly, colourful foods to tempt him each week. I post the pics on Instagram - #yumbox - every week, and on my Facebook and Twitter accounts and I shall try and blog them here too. Here is a selection of the few I've done so far. I will admit that buying the silly food picks was a brilliant investment, as well as being a practical way for him to eat prepared foods. Many of the foods are shop-bought and involve no effort at all. Each box took about 5 -10 minutes to assemble. 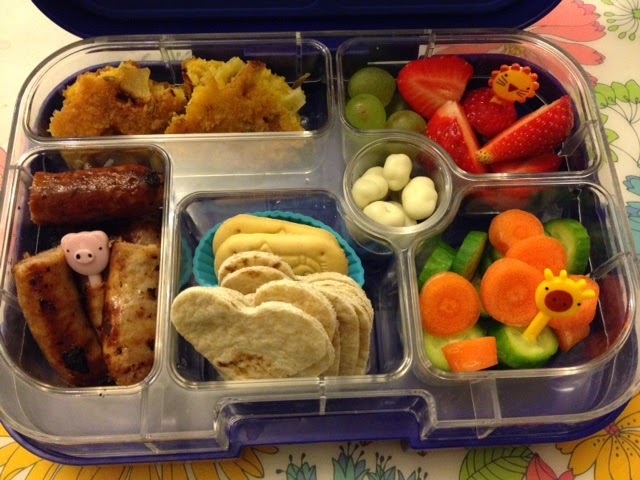 Mini pork pies, mini picnic eggs, mini Goodies organix cake bars, Polish "Junior Safari" animal shaped crackers, slices of brioche, strawberries/raspberries/grapes mix, cucumber wedges and sweet radish halves. Yoghurt coated raisins and fruit hearts in the "treat pot". "satay" chicken mini skewers (no peanut), flower shaped cheese sandwiches - half of which are threaded onto a pretzel stick skewer, animal crackers and the in-between pieces of sandwich stabbed onto the tops of more pretzel sticks. Cucumber/peppers/mushrooms. Strawberries and grapes. Iced gems and white choc buttons in the "treat pot"
Organic sausages (left over from supper, yes, I put a pig pick into the pork sausages. So sue me!) pieces of "dal vada" - a tasty lentil cake snack from South India; chapatti hearts; Minion biscuits; mini cucumber and carrot wheels; and strawberries and grapes. Yoghurt coated raisins in the treat pot. I think this was the first Yumbox I made. A mini snack roll with cheese, salami stick and a slice of salami, baby carrots, pre peeled mandarin with grapes, and iced gems in the treat pot. 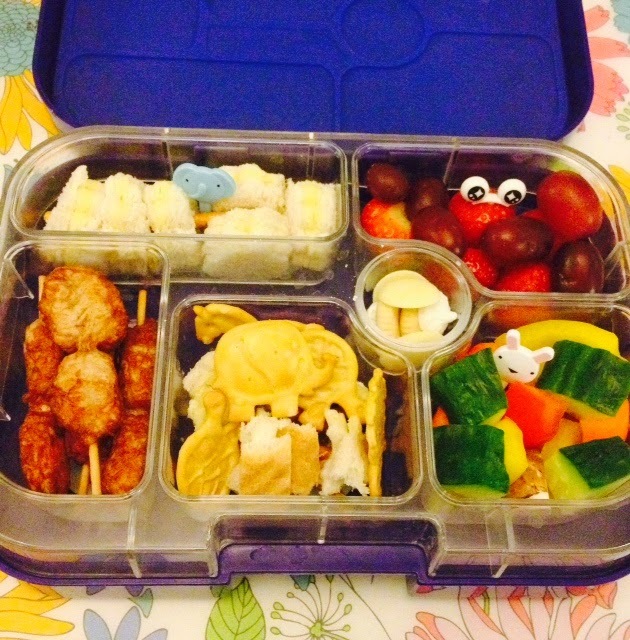 In other boxes, I have also given leftover mini toads in the hole (home made); chicken goujons, hearts cut out of cheese, flowers cut from slices of carrot, baby sweetcorn circles, blueberries, oatcakes, dry cereal, mini crackers and even a bunny shaped boiled egg! I think it is important to have fun, but not spend too much time, energy or effort. When your 3 year old only eats half of it, it is likely because you have provided too much in an effort to give enough variety, but I do find Tiny will happily finish anything that is left over once he gets home as his after-school snack, but it doesn't stop it feeling a bit deflating when you have spent ages making it to see it unravelled and half eaten, so quick and simple is less of a "set up" for that. I'm really hoping the boxes and picks and other accessories become easier to get hold of. I firmly believe that having variety of boxes or plates can make repetitive easy meals more interesting and fun details don't have to involve cutting facial features out of seaweed!